Darlene with you today and it's my turn to share a new, inspirational creation using dies from the Tutti Designs Store. Have you checked out this new die company yet? If not, you truly owe it to yourself to pop over to see the fabulous die designs available. They just came out with their 3rd release and keep watching because there is MORE TO COME! The background for my card was created by brayering dye ink over an Anna Griffin embossing folder then running it through my embossing machine using white card stock. Easy and very effective! Here's how it all began! I thought I'd give water coloring my dies this time around and I LOVE how easy and beautiful they came out! I used the same angle brush, my water colors and a spray bottle of water. I kept a wet baby wipe next to me to clean the brush in between colors. A spray of water into the color of my choice and away we went . . .
First the little pink flowers ...Next my hummingbird ... what fun it was to color him! Starting with the ruby throat then a mix of blues and greens. 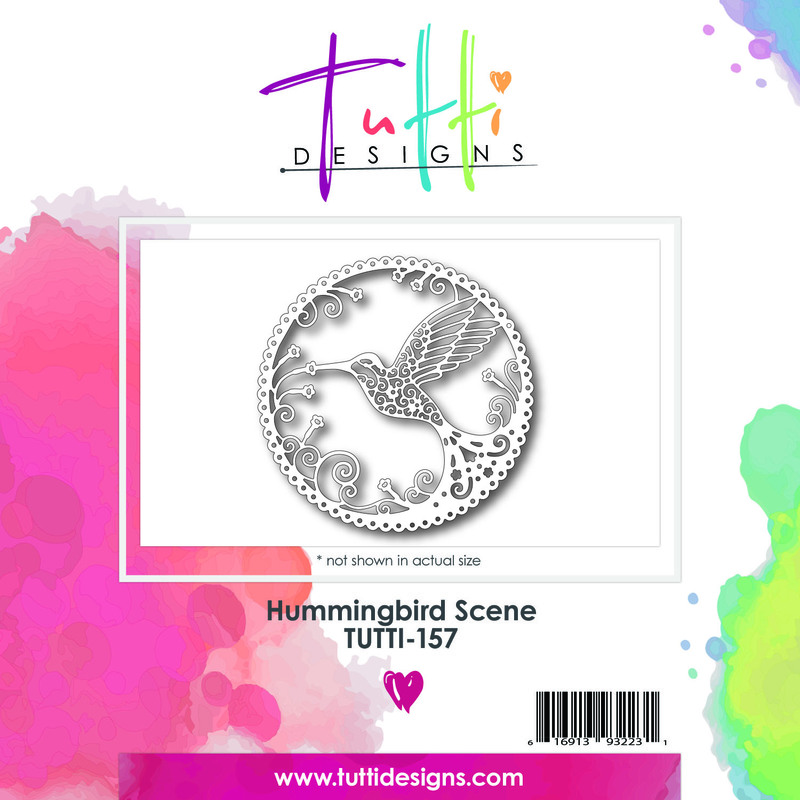 I could have stopped right there but decided to do the outside circle in the lime green to keep it subtle and still showcase the colors on this beautiful hummingbird die. I also wanted to achieve a little more dimension so I die cut my hummingbird two more times. Once using white and again using black card stock then glued them together with just the slightest 'off set' with each panel. A little ribbon and a few sequins were all that was needed to complete today's creation! 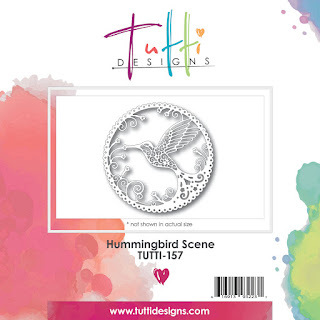 Please be sure to pop over to the Tutti Designs Store and check out all of these fabulous dies. The team has something new to share here on the Tutti Designs Blog EACH and EVERY DAY! Pop on over often and see for yourself ... what a talented group of designers! !